As a followup to last week's post on custom controllers, I'd like to introduce the Wacom radial menu. Unlike custom input hardware, this doesn't take up any desk space - but it might be a powerful addition to your workflow. 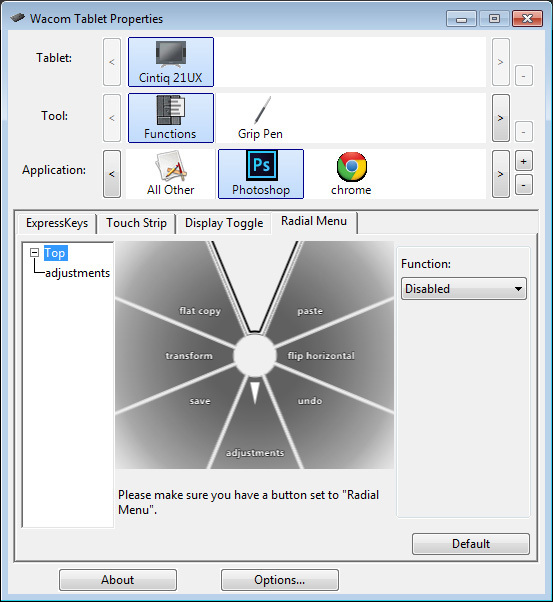 Hidden inside the Wacom Tablet Properties (under the Functions tab) lies an often-overlooked gem: the radial menu. It's a circular menu which allows you access to useful hotkeys and commands, and displays itself automatically centered around your cursor position. This means the radial buttons are exactly where you need them to be, and don't take up screen real-estate when you're not using them. To launch the radial menu, assign it to one of your Wacom buttons (either on the stylus or on the side of your tablet). What functions can radial menus trigger? Think of them as additional stylus buttons. Anything you can control with a stylus button, radial buttons can do the same. Obvious choices are keyboard shortcuts and button presses. Less obvious are operations like opening folders, controlling media playback, opening a web browser, or changing the system volume. The default radial menu contains 8 buttons, and for most users this is plenty. If you'd like more, any of those 8 can trigger a sub-menu -- which contains a new set of 8 buttons. An example sub-category might be "adjustments", containing your commonly used commands like Levels, Hue/Saturation, Variations, etc. Just like other aspects of the Wacom Tablet Properties, all of these settings can be software specific. This means that I can have a radial menu that displays photoshop-only commands, and a different one for web browser commands. Especially for simple software like Firefox, 8 commands are more than enough. To create a software-linked menu, simply add an item to the application list, and have it highlighted while customizing your radial menu. As great as a stylus might be for drawing, it can be a challenge to operate menu items, buttons, or other elements designed for a mouse. For anytime you find your stylus lacking, a radial menu might save the day. Though your usage will be different than mine, it's a very powerful option. After all, how do you middle-mouse-click with your stylus? We'd love to hear creative uses for the radial menu, so please speak up in the comments!